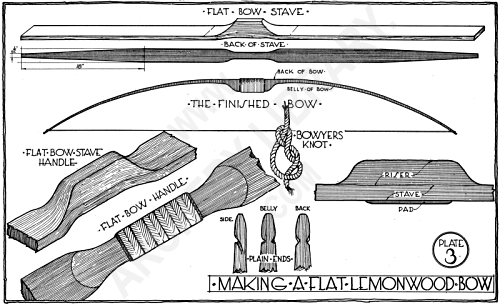 The Flat, Semi-Indian type bow merits special consideration. Although the idea is not new, its present growing popularity is due to the many advantages it possesses. The fundamental principle of this type of bow is that a wide, thin, flat slat will bend easier and be less liable to fracture than a square stick of the same volume of wood. This feature makes it possible to use a 28" arrow in a 5'6" bow, and, naturally, since a shorter bow of the same weight will shoot farther and faster than a longer bow, you get a flatter trajectory. Further, a well proportioned flat bow is easy to string, sweet to use and has lots of punch. It is well established that the nearer to the center of a bow the arrow can pass, the less side variation there is in its flight—hence the narrowed handle of the flat bow, thickened from back to belly for the necessary stiffness and strength. See Plate 3.